Thank you for visiting the website of Tokyo Japanese Steak House and Sushi Bar! In 1996 we opened our doors to our first location in Southeast Texas on Dowlen Road in Beaumont. Our approach to sushi along with our energetic mood began to draw in customers. These customers quickly became our guests with their repeated business. As we became more familiar with the community we knew we had found a home here. We spent the next ten years mastering our techniques so that we would always be able to provide the highest quality meals that we can. Everyday our guests enjoy the finest hand carved steaks, along with the freshest seafood available, all prepared right at your table by our most excellent chefs. Our master sushi chefs take great care in preparing the perfect rice to compliment the freshest fish available. 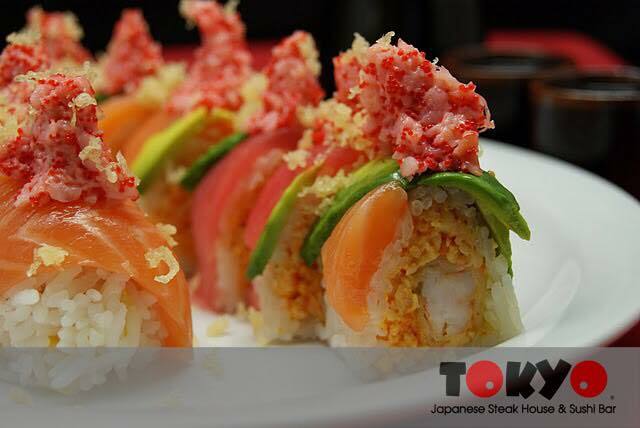 Guests at Tokyo Steakhouse can choose sushi, sashimi, or from over fifty rolls offered each and everyday. Specialty rolls are always offered as well as selections from off the menu. After just ten short years the demand for our cuisine and atmosphere outpaced our ability to pamper our guests. We made the decision to expand and in 2007 we opened our second location in Beaumont on IH-10 (Interstate Ten). We were proud to offer the community a new restaurant with seating for 250 people. At our IH-10 location guests have their choice of how to dine with the availability of three separate banquet rooms, a bar area, covered patio, a sushi bar, or one of our famous tepanyaki grills. As the popularity of Tokyo Japanese Steak House and Sushi Bar continued to rise, it was time for us to grow once again. We are excited about the opening of our third southeast Texas location in the Mid-Jefferson county area. This new location is completely designed by our own team and offers an ambiance that is sure to please any of our guests.